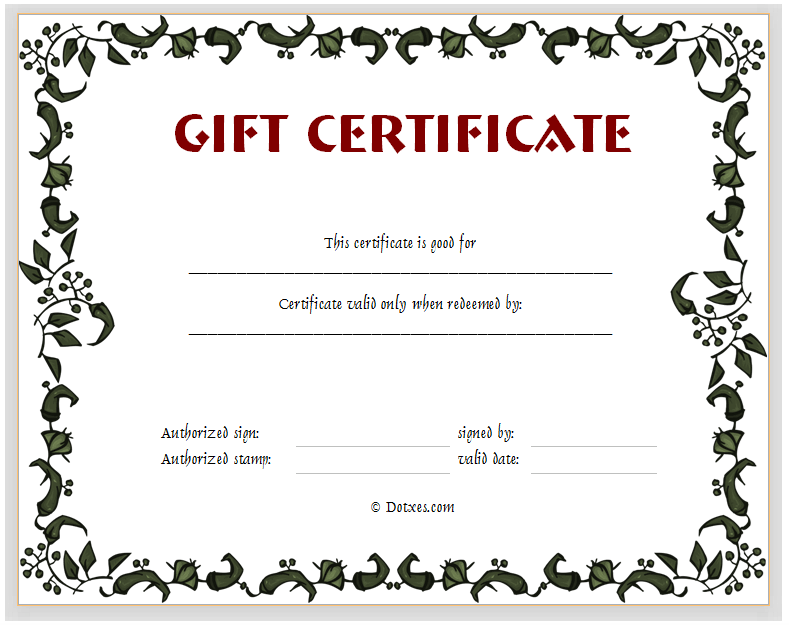 There are numerous occasions that might prompt someone to give an individual a gift certificate. The fact is that a lot of people have trouble deciding on the perfect gift for an individual. Those frustrated people gravitate toward the gift certificate. Actually, a gift certificate is a great way to reward an individual for a job well done, holiday, or special occasion. All it takes is a gift certificate template to create a unique certificate. The gift certificate template that is featured on this page is very unique and has a great floral design around the edges that will immediately capture your attention. At the top, the gift certificate template is printed in bold letters. Below are other fields that include a place to add the receiver’s name, field to add receiver validity, section for authorized signature, signature, section for authorized stamp, valid date. Download the gift certificate template and create a professionally designed gift certificate within minutes. The gift certificate is completely formatted. Simply use your word processor to add information to the fields. Modify the template, edit, or customize to fit your specific requirements. Change the color of the template or fonts to match a holiday or special occasions. Remember to save the template to file for future use.